← Leadership Can’t Be Taught . . . When you grow up in a household of teachers (Mom taught English and Music, my Dad taught Math and coached basketball, taught aircraft engine mechanics during WWII, then later in life became a District Principal and County Superintendent of Schools in California), education and lifelong learning just seems to be a part of your DNA. At least it is in my case. Funny thing about education. Most people believe the role of education is to “pour in” knowledge, facts and information. The most educated are those who can cram in the most and then spit it back when the time comes! How many remember cramming for exams in high school and college? But the word “education” comes from the latin root, “educo” which roughly translates as “to draw out” or “to lead out”, not to pour in or fill up. Effective education is more about drawing out wisdom and insights from the student than pouring in knowledge or information. Those who come up with their own answers, sometimes being prodded by a teacher asking insightful questions, tend to learn the lessons more deeply. We all learn more by experiencing the lessons than by reading about them or being lectured at. It’s one of the reasons there are physics labs, biology labs and chemistry labs in high school, so the student can learn through a hands-on experience. Getting a driver license is the same thing. Read the rules of the road and you can pass the written test, but it takes experience behind the wheel to pass the road test and get your license! I started out to become a scientist and ultimately a college professor. So after going to both undergraduate (University of California 1966-1070) and graduate school in biology and marine ecology (Harvard University 1970-1972) I wound up doing a Ph.D. degree at the University of Hawaii. Then a funny thing happened. I left academic life to become a workshop facilitator for a large organization teaching classes in personal development and relationships, where for the next four years I honed my skills as a large group facilitator (100-200 people over a 4-day intensive self-development workshop) with a monthly circuit taking me from Los Angeles, to Honolulu, to Toronto, to Phoenix. Gruelling, but talk about experiential learning. I quickly became adept at understanding and managing group dynamics. We even facilitated self-improvement workshops in the Hawaii State Prison. 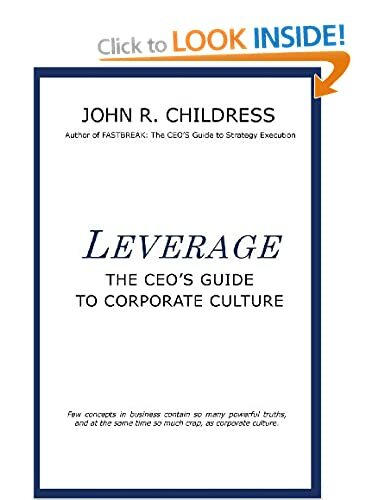 Then in 1978 I co-founded an international management consulting firm focusing on the facilitation of culture change, leadership team alignment, and business transformation. The recovery and restart of the Three Mile Island Nuclear Plant was one such assignment that called for experienced facilitation skills. So, fast forward 35+ years later and what do I do? I design and facilitate offsite workshops for large corporate senior leadership teams in developing and executing competitive strategies. 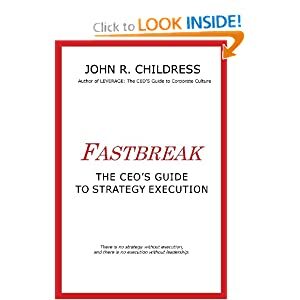 This process is based on my recent book, FASTBREAK: The CEO’s Guide to Strategy Execution. There is no strategy without execution, and there is no execution without leadership! What do you do? Maybe we will meet in an offsite workshop one day! This entry was posted in consulting, corporate culture, Human Psychology, John R Childress, leadership, Organization Behavior, Personal Development, strategy execution and tagged Albert Schweitzer, education, facilitation, Hawaii State Prison, leadership alignment, leadership coaching, Leadership DNA, school teachers, Three Mile Island. Bookmark the permalink.